Billboards along busy highways and freeways are the foundation of out-of-home advertising in most North American markets, but not in Vancouver. The market actually has no freeway system. But Vancouver is still a rich place for OOH advertising, and for two reasons. First, the roadside signage that is available is more visible to drivers since they’re not whizzing by at 75 miles per hour on a freeway. Also, the lack of highways means many people use public transportation, which affords plenty of dwell time and advertising options. To find out more about the out-of-home landscape in Vancouver, read on. This is one in a Media Life series on buying out-of-home markets. Vancouver is the only North American city without a freeway system, though it does have 13 bridges and tunnels that connect the city to outlying areas, as well as a vast public transportation network. There are still some roadside billboards and signage available downtown as well as in commercial areas. Like many markets, the downtown area of Vancouver is one of the busiest and most attractive parts of town for OOH advertisers, although city regulations limit the inventory. That puts a squeeze available inventory, but there are other options for advertisers, mainly through public transportation. 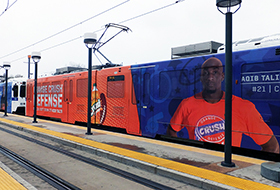 No freeway system means public transportation in the market is popular, with standard advertising options such as shelters, exterior and interior signage on buses and trains, as well as buses and train cars that can be completely wrapped. 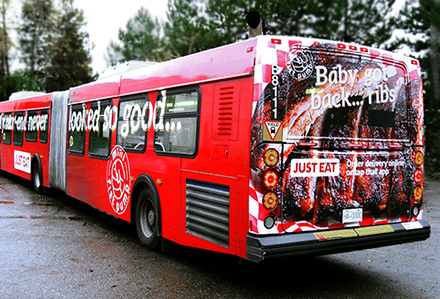 Since billboards are limited in parts of metro Vancouver, wrapped buses can serve as a form of mobile billboard, highly visible ads rolling through parts of town where signage is otherwise unavailable. A new feature in Vancouver OOH is fully wrapped wifi buses, which are branded inside and out and offer passengers free mobile wireless internet, sponsored by the advertiser (shown above). There are currently six of these buses in Vancouver. There were 1,364 billboards in the market as of April 2013, according to the Out-of-Home Marketing Association of Canada. Public transportation in Vancouver attracts more than 230 million riders per year, according to TransLink, the transportation authority in British Columbia. In 2012, the most recent year available, Vancouver reported 151.8 million bus rides, 3.4 million trips on the Seabus (ferryboats), 50.5 million on SkyTrain (a three-line railroad system), 29.4 million on the Canada line (a separate railroad line) and 2.3 million on the West Coast Express (a weekday commuter rail line). The Canadian Out-of-Home Measurement Bureau (COMB) measures out-of-home inventory for members throughout Canada, similar to TAB in the U.S. Some of the most common categories using out-of-home in Vancouver include mobile phones, cable TV/internet providers, alcoholic beverages, automotive, retail, local TV/radio stations and fast food. The median household income in Vancouver was $71,140 in 2012, the latest data available from Statistics Canada. That was up from $68,970 the previous year. Vancouver is a very diverse market, with eight ethnic origins making up at least 5 percent of the city’s population: English (20.8 percent), Chinese (19.0 percent), Scottish (14.6 percent), Canadian (14.4 percent), Irish (11.4 percent), East Indian (9.6 percent), German (9.3 percent), French (6.1 percent) and Filipino (5.3 percent). Typical lead time for static inventory is 10 to 15 days, while lead time for digital formats is just 48 hours. Pricing is similar to other major North American markets. Billboard pricing can start in the low thousands per month and rise in higher-traffic locations. A basic sign on a bus can cost hundreds of dollars per month, while fully wrapped buses cost between $5,000 and $10,000 per month. Recent or current out-of-home advertisers in Vancouver include Meijer, McDonald’s, Toyota, Smashburger, SHOEme.ca, Vancouver Aquarium, BC Lions, Citizen, Apple, Ikea and Miller Lite.